Similarities are easily traceable due to great diversity of the Valais-German and Walser-German. The whole Valais-German and Walser-German, excluding other speech areas, is characterised by a single sound: it is the shared “Sch”-sound which had been obtained quite often in Valais and with the southern Walser and less with the eastern Walser. 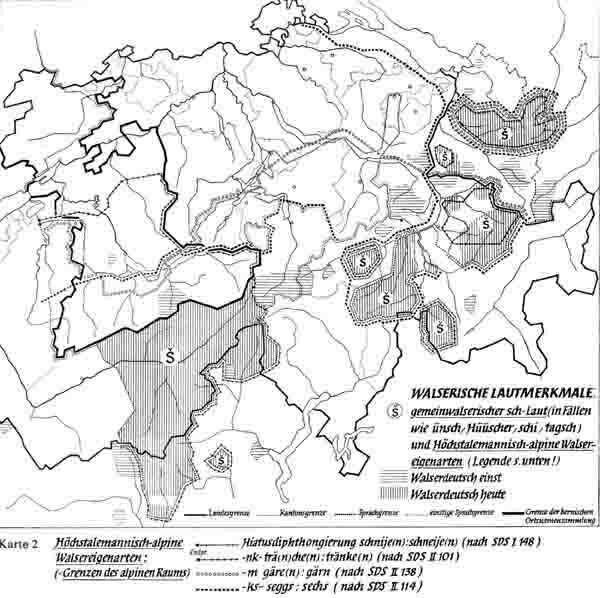 The following criteria go beyond the Walser regions but they are unique indications for the Walser language in Graubünden, Liechtenstein, and Vorarlberg. “nk” or “ng” becomes “ch” and the prefixed vowel is distended. For example triicha, deijcha, heijcha or booch. “rg”, “rn” or “rm” becomes “ra” and the consonants following a “r” become a double vowel. For example moora, gäära, tuura or hoora. A predicate is used as an adjective. If there are two successive vowels, like in co-operation this is felt as unpleasant for the speaker and an extra consonant is put in between. It is characteristic for the Walser to form the suffix.